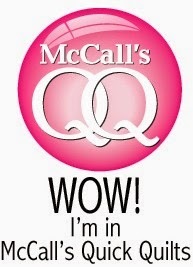 Congratulations to the two winners of the Play it Again Giveaway, Kathy Davis and Quilting Tangent! 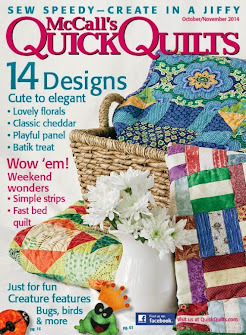 They will each be receiving a copy of McCall's Quick Quilts October/November 2014 issue. I will be emailing each of you shortly to get your mailing info. 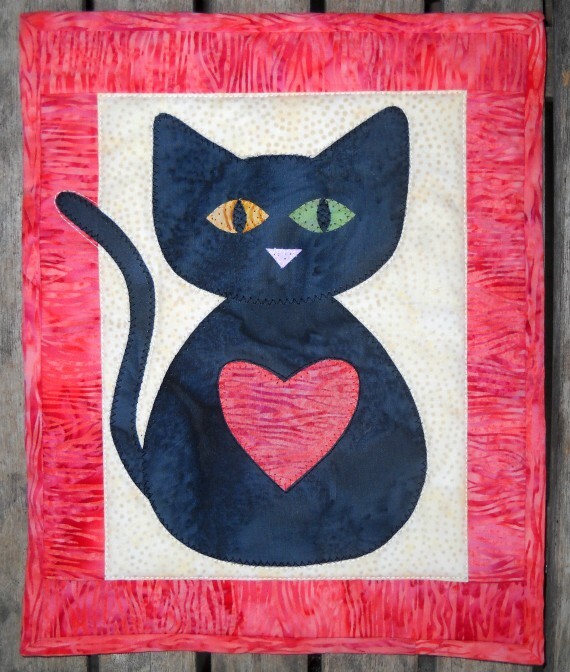 Kathy Davis wrote: Quick Quilts, that is my kind of quilt! 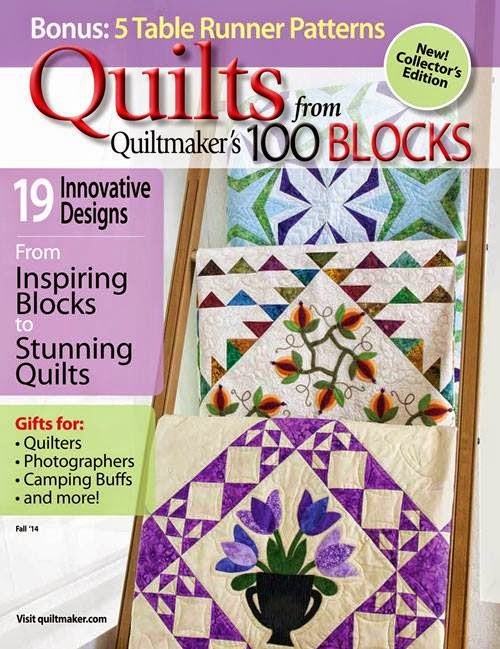 Quilting Tangent commented: Congratulations on being published. Thank you for your lovely comments, and enjoy your magazines! 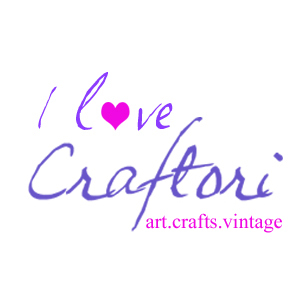 Did you know Craftsy has a large variety of free - YES! Absolutely free! 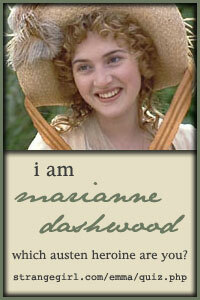 - mini classes you can enroll in and enjoy? 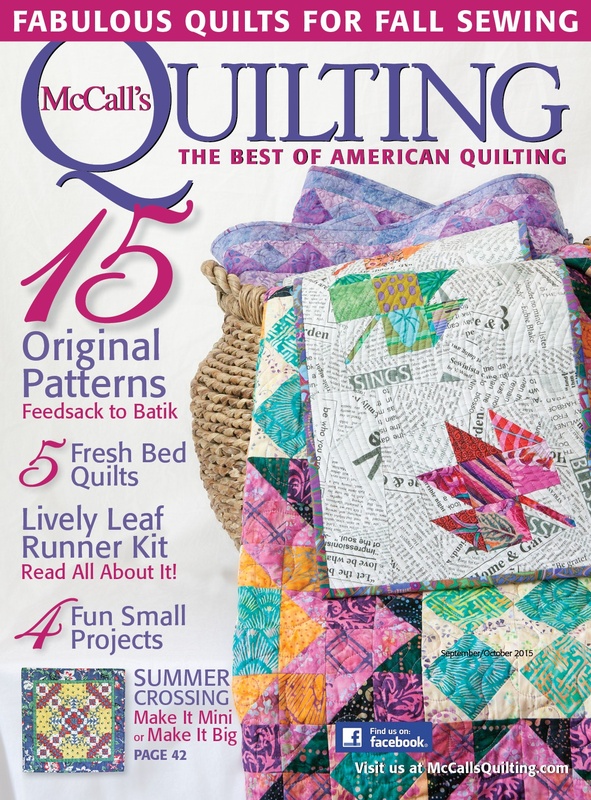 A new look at Long Arm Quilting. I just enrolled in this one and I'm looking forward to viewing it next week, when the kids go back to school. A little back to school treat for me! This class is a must for every sewer! Who doesn't need to brush up on machine basics once in a while? Creative Quilt Backs. Who says all the fun has to be on the front of the quilt? 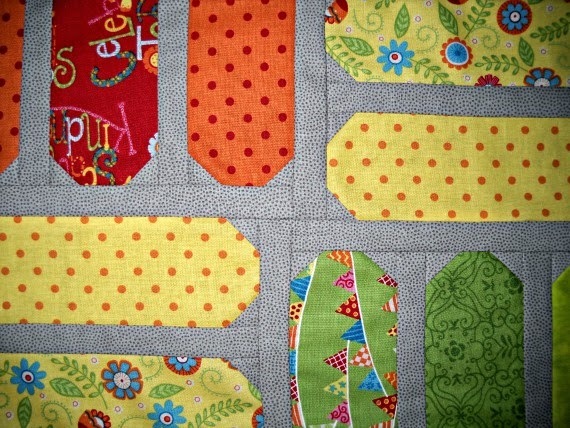 Sewing a unique backing for your quilt can be fun and very freeing, too. Fun! Fun! Fun! Click on this link to see a whole list of fantastically free Craftsy classes to try: Here's the full list of Craftsy free mini classes to choose from. 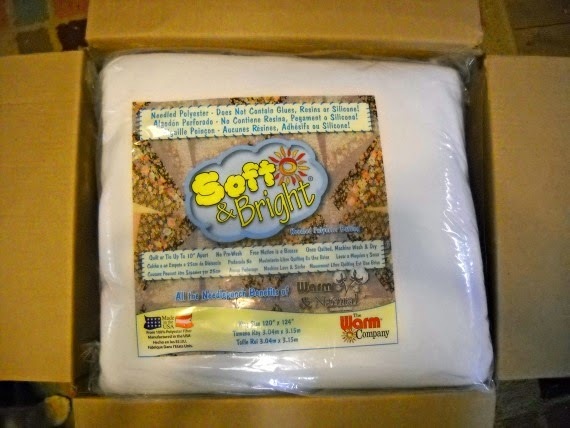 The Play it Again Quilt & Giveaway! 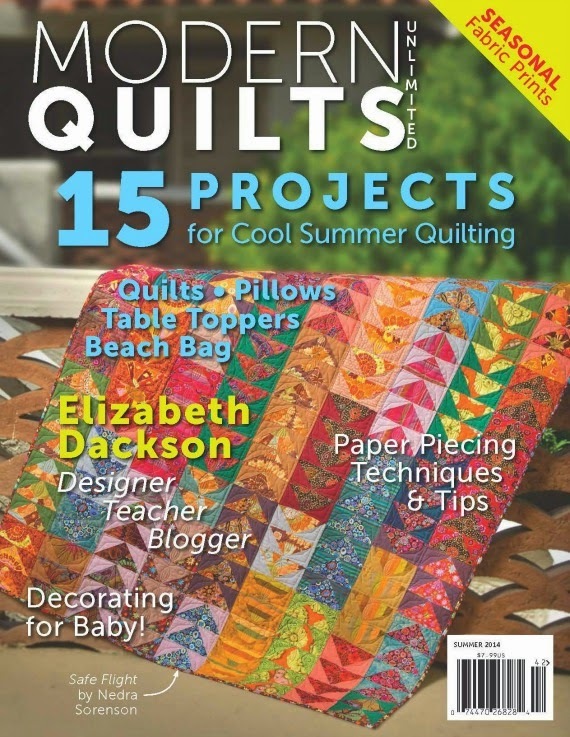 My "Play it Again" quilt is featured in the October/November 2014 issue of McCall's Quick Quilts. 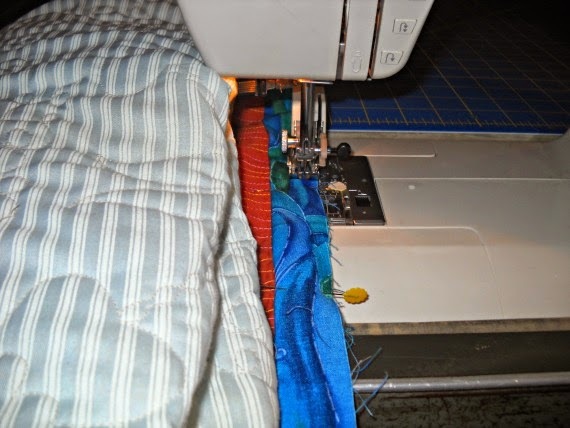 This is a super fast to sew quilt with an ultra modern look. 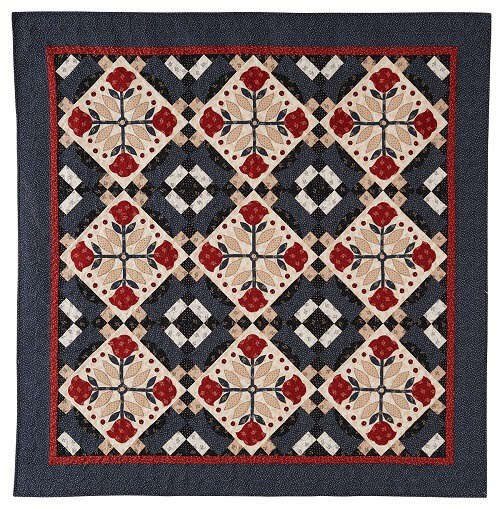 Now that it's back home, it's the perfect quilt for cuddling under on my soft, brown sofa. 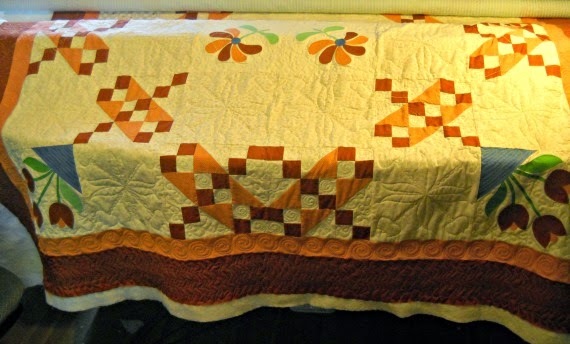 For this quilt, I used Timeless Treasures Fabrics, The Warm Company's Warm and Natural Batting, and King Tut Thread by Superior Thread. I quilted it simply, just straight up and down lines. Sometimes simple is the best. The magazine will be in stores on August 26. 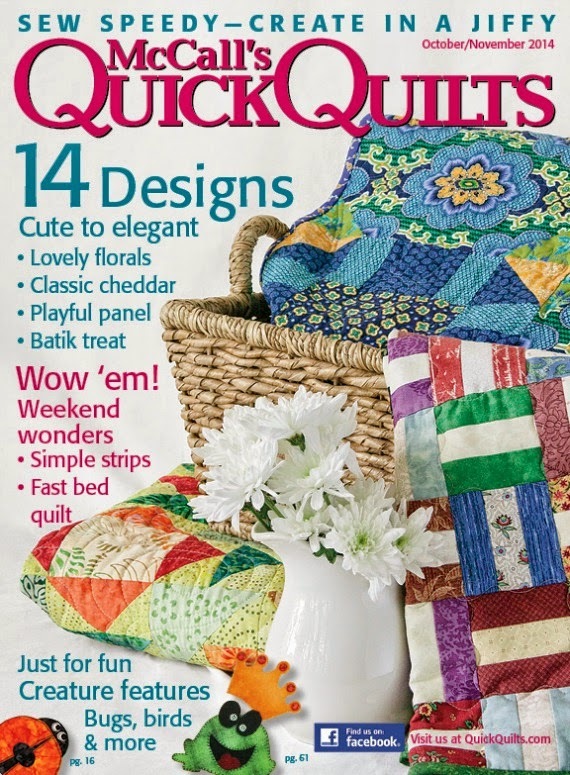 I'm giving away two copies of the McCall's Quick Quilts October/November 2014 issue. 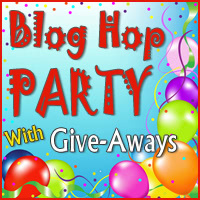 Just leave a comment below and I'll randomly choose two lucky winners. 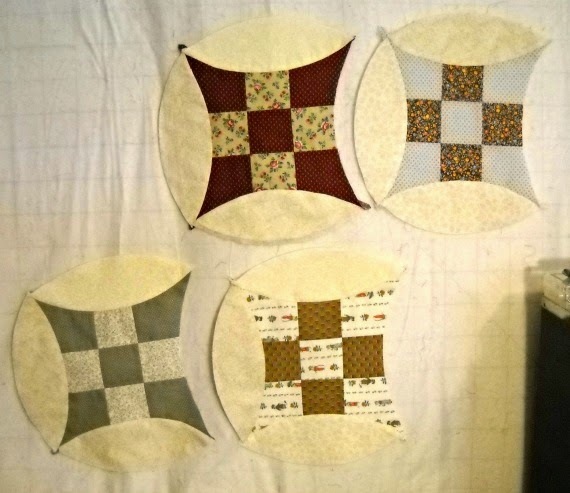 I've come up with eight simple ideas for the setting for the Star BOM quilt. I'm not going to put the blocks together in this order, but these are the different ideas I came up with for a layout. 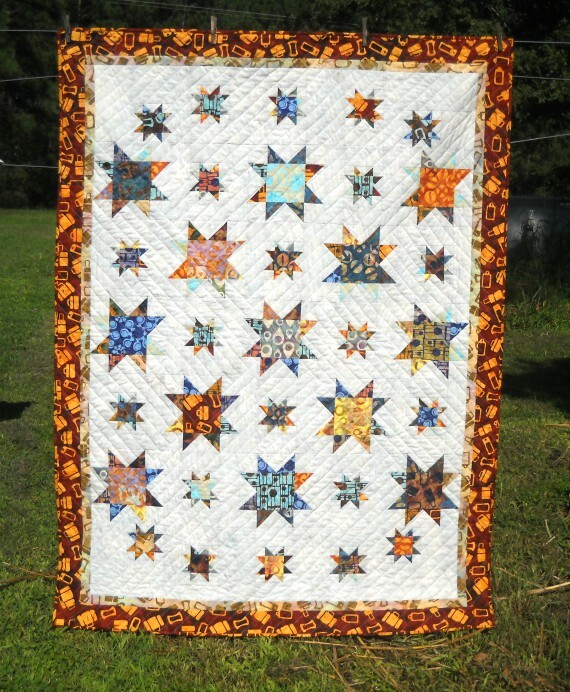 I think it will be best to do something simple so the blocks remain the "stars" of the quilt. This is as simple as it gets! Skinny sashing with cornerstones to separate each block, and a thicker, dark brown border on the outside. 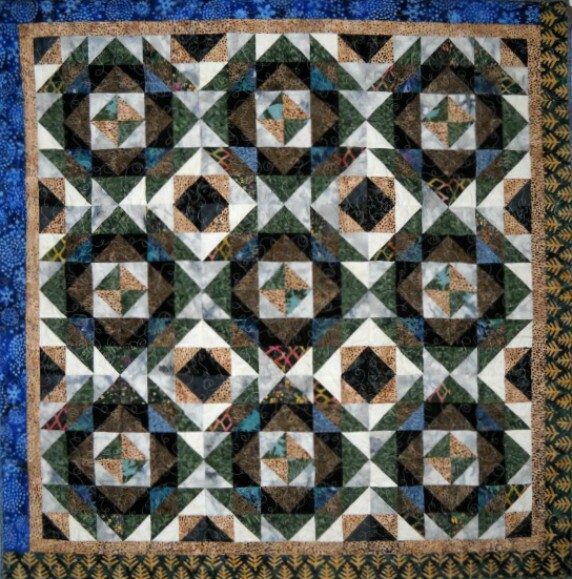 The sashing and cornerstones are thicker than in the first quilt. The cornerstones are little pinwheel blocks. Diamonds in the sashing and the pinwheel cornerstones. Back to the skinny sashing. 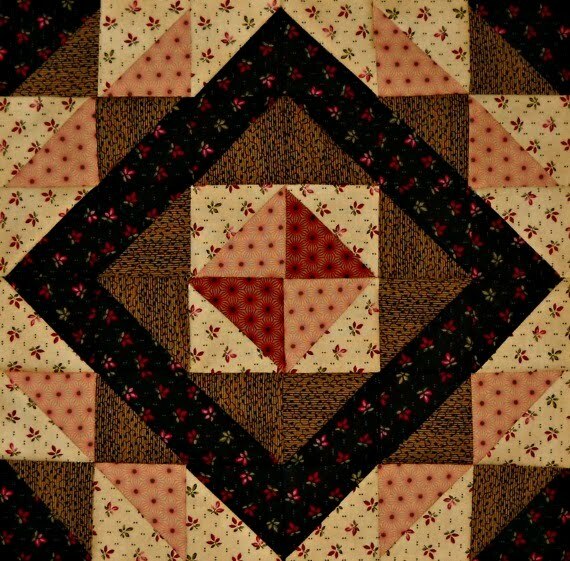 Border one features random squares of the different fabrics used in the star blocks. 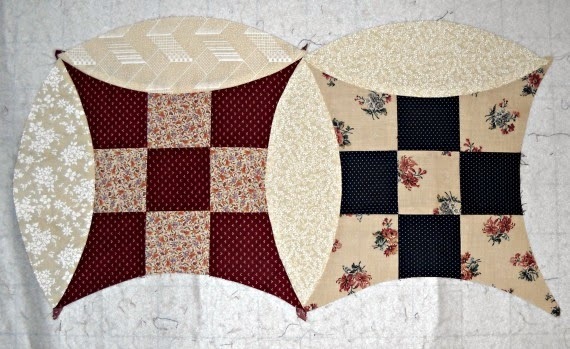 Circles in the cornerstones to give this quilt a few curves. Border one features small points. Circles in the cornerstones. Border one has been eliminated. What is your opinion? I could use a little help choosing this one. Please comment below. 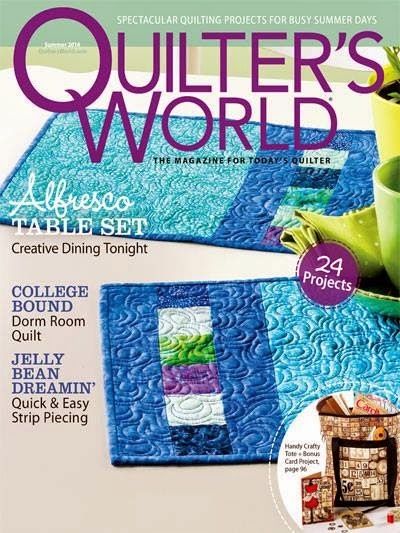 I will be taking suggestions here and also at the Facebook Quilters Show and Tell Group. Thanks so much! Seven. All vintage fabrics from my stash. 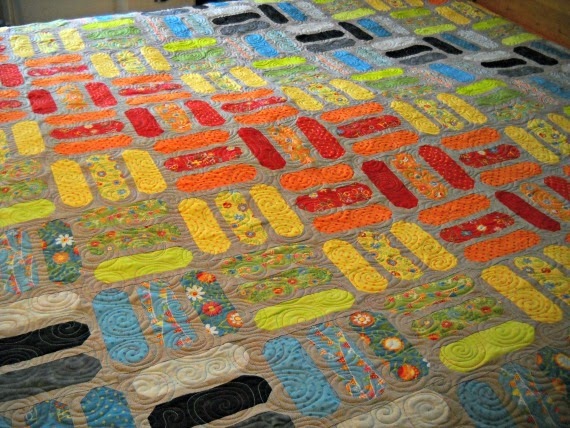 Will it ever get sewn together? Or will it go back up on the UFO shelf again???? So curvy...rolling around on my design wall. This is fun..and terribly addicting. Another quilt almost finished! 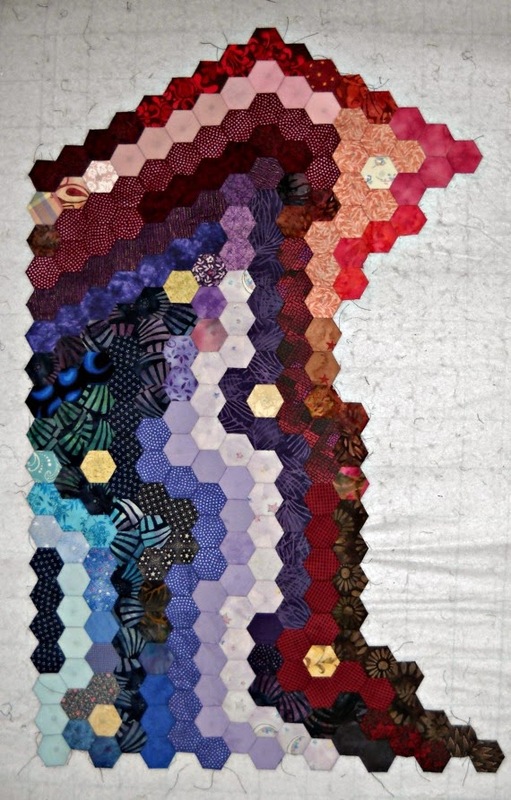 Here's Sally's Mystery quilt, as it's coming off the frame. Sadly, it has been raining like it's Noah's Ark around here, so I haven't been able to get outside and take pics of the whole quilt. It looks like it might clear up tomorrow. 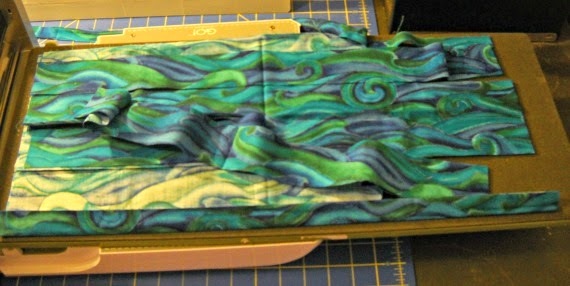 I chose this pretty blue/green wavy fabric for the binding, and quickly cut the strips with my Accuquilt Go. 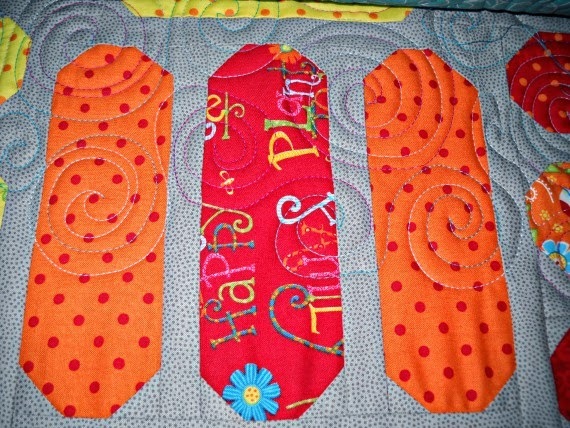 I love cutting binding strips this way - all at one time! Here I sewed them all together into one looooooonng strip. And here I am stitching it onto the edge of my quilt with a walking foot. All the hand stitching was done this week on my front porch, which luckily has a nice roof over it! But again, no pic yet. 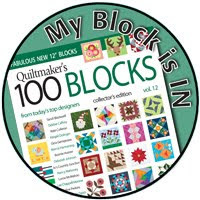 I chose the blue binding because there is a little bit of blue in the applique blocks, and it added a nice frame to the whole quilt. Aura, Day 6. I've added some different hues of pink and brown. 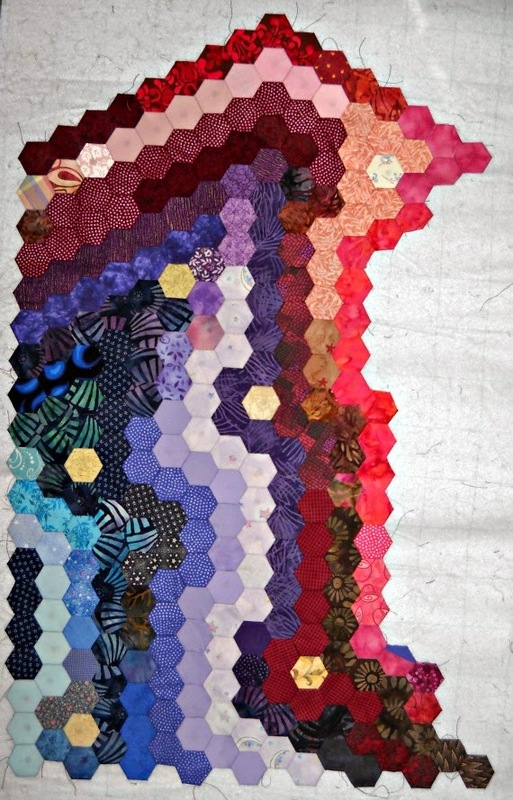 The Patio Quilt. 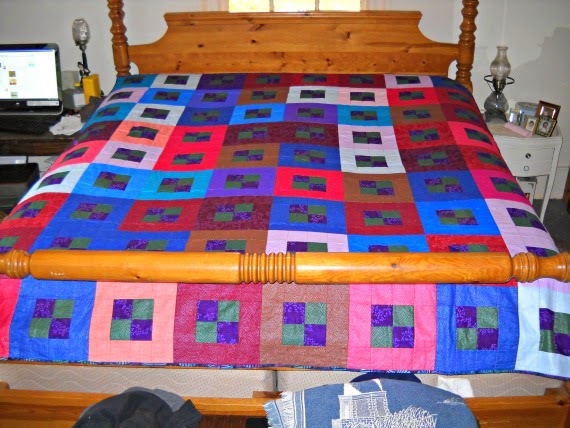 I loved making this quilt! Everything about it was enjoyable. The fabrics are bright and cheery. The batting quilted like butter. 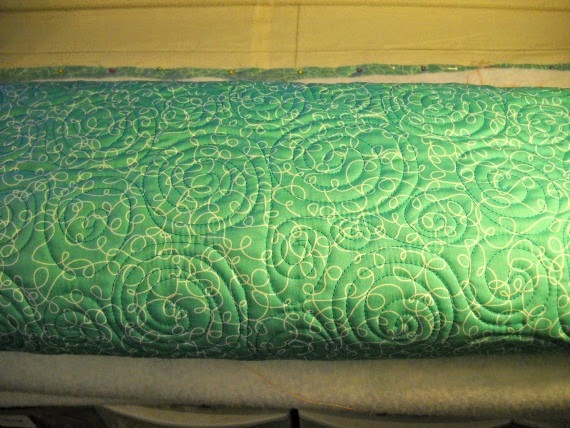 The swirly quilting came out well. 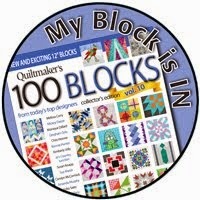 It was allover one of my best quilting experiences. Here's a shot of it on my bed. 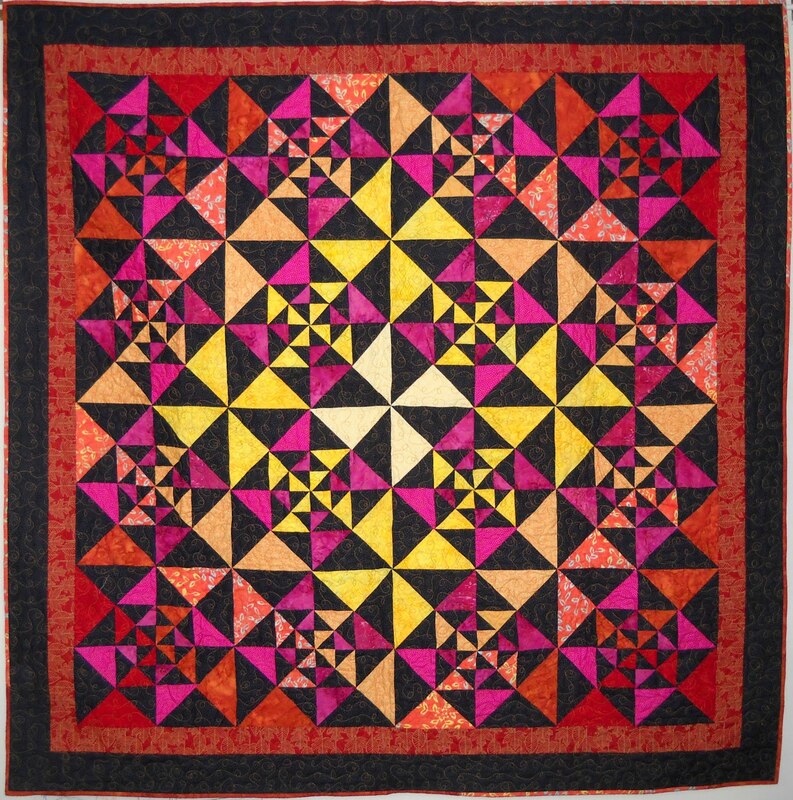 It is a large quilt, 82-1/2" x 90-1/2". 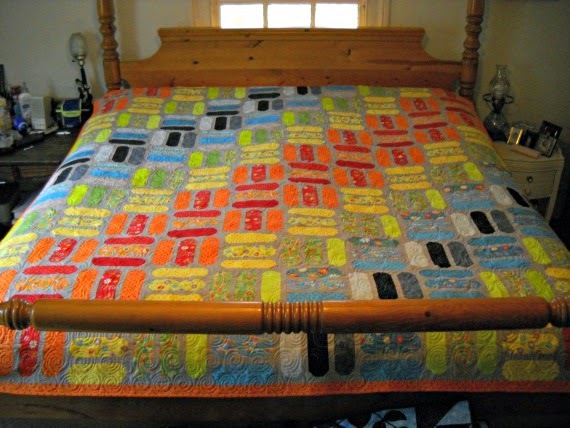 It's tough to take a picture of a quilt this size. I used the Moda Fabrics Bloomin' Fresh by Deb Strain collection, and a few fabrics from the Moda Marbles collection, too. 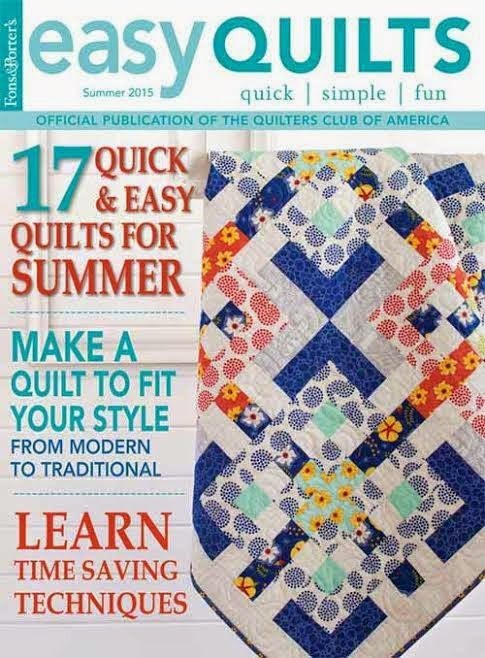 The pattern for the Patio quilt appears in the just released Summer 2014 issue of Modern Quilts Unlimited Magazine. 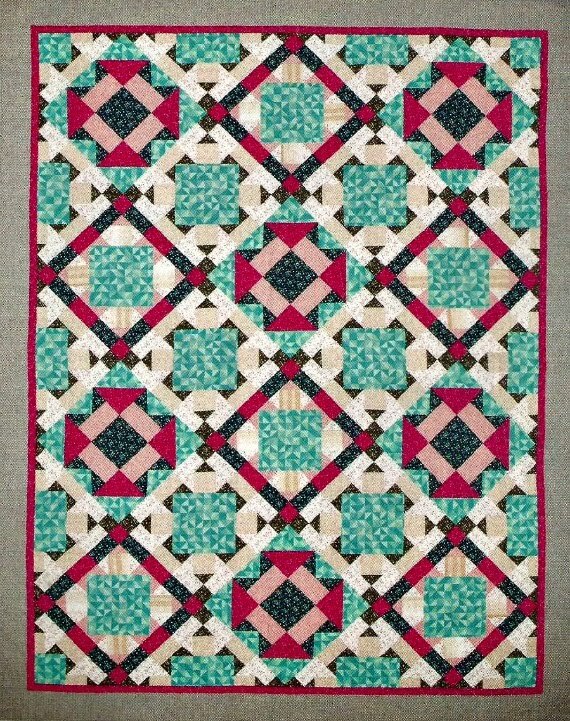 They did an excellent job of presenting this quilt. 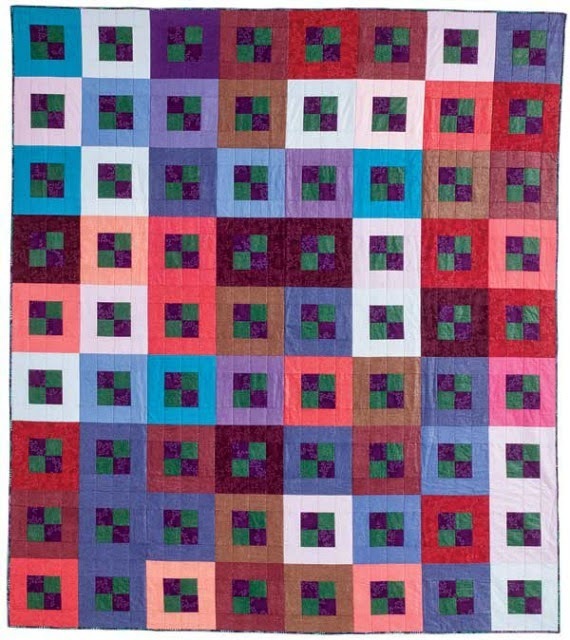 One of my favorite parts of this quilt is the way the corners of the blocks come together. 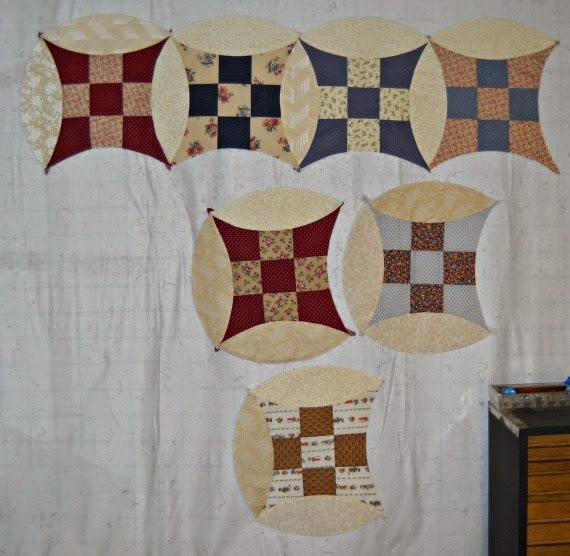 It looks complicated, but it's really very simple, straightforward piecing. 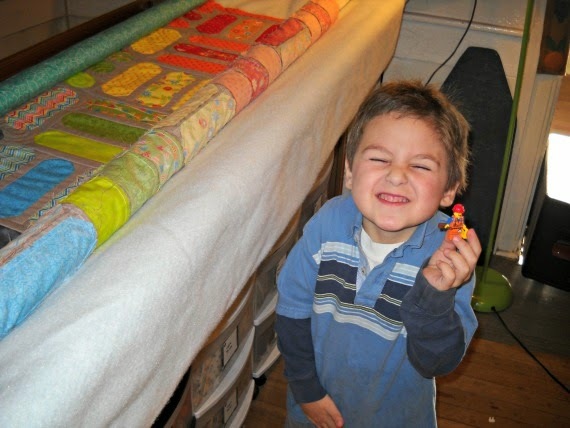 My little guy with his favorite toy, The Emmet character from the Lego Movie, posing next to the Patio quilt, and sporting his famous smile. 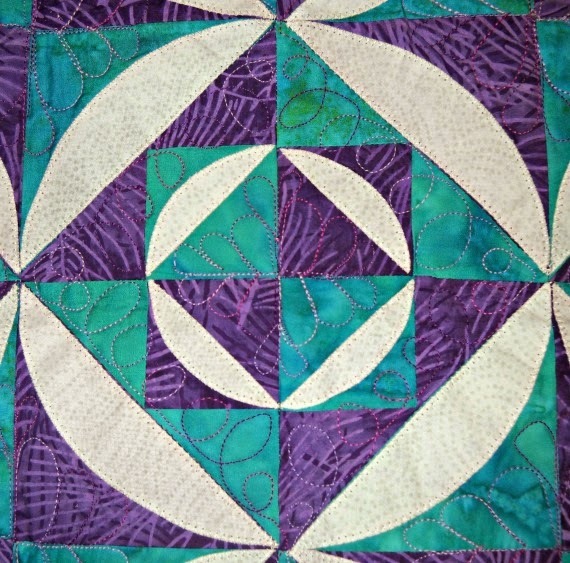 Swirly quilting! I love stitching swirlies. I used the Soft & Bright batting from The Warm Company. Excellent batting. 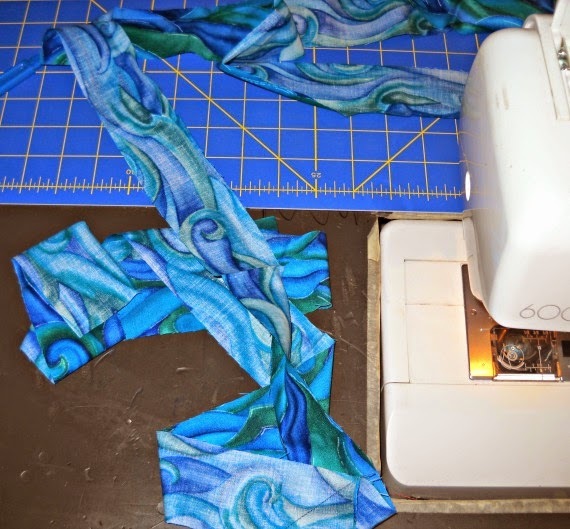 A sea of blue swirlies on the back of the quilt. 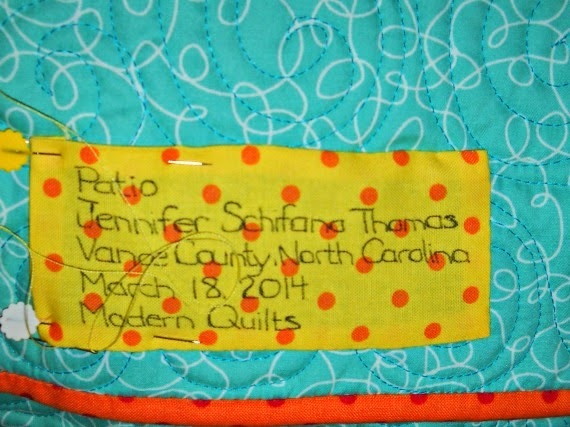 This quilt was so much fun that I used this yellow polka dot fabric for the label instead of my usual plain muslin. My Beaches quilt returned home yesterday. This is a small wall hanging I made using 3 yards of fabric for the top. 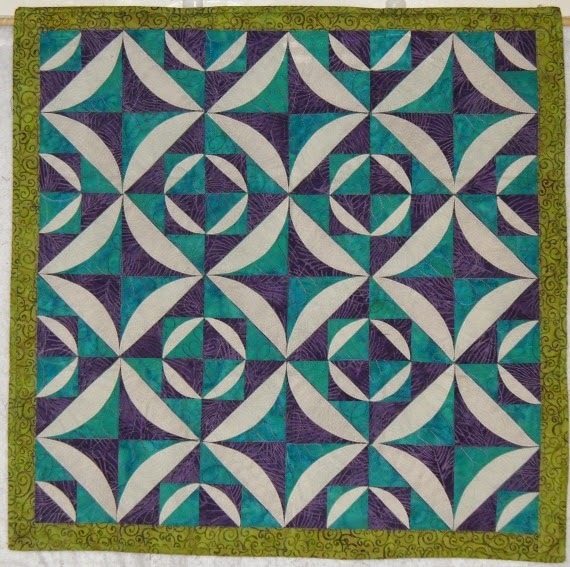 It features three of my favorite quilting elements, curves, batiks, and fusible applique. I practiced my feather quilting and did some fun loopy quilting in a variegated thread. In this photo you can see the gorgeous deep colors of the batik fabrics. 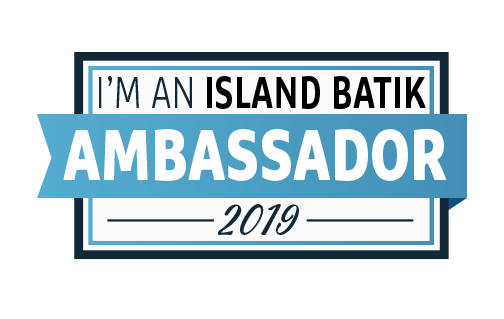 These are from the Island Batik fabric company. I looooove their fabrics. I used The Warm Company Warm and White batting, too, one of my favorite batts. It quilts up so nicely. 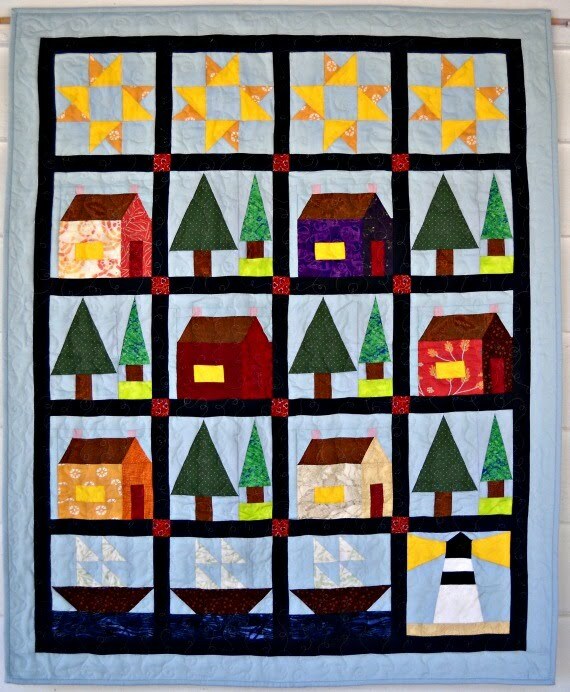 The Beaches quilt and pattern appears in the new book by Annies, It Takes Three, along with seven other fun to sew projects. 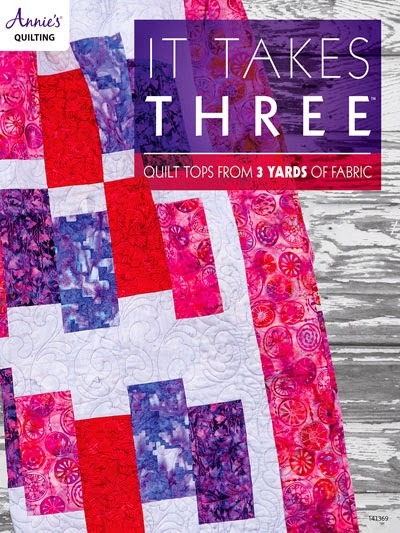 All the projects in this book take three yards of fabric or less for the quilt top - Yay! Fast and fun!